Net Entertainment have just opened a new theme park and it’s one which is weather proof for you to visit all year round (rather than get drenched by the rain at Thorpe Park) with adrenaline pumping rollercoasters to hold on tightly, haunted houses to explore, a Ferris Wheel to enjoy the surroundings, and all sorts of other fun activities for a fun-filled and very rewarding day! The busy atmosphere of theme parks has been captured perfectly for the Thrill Spin slot machine as you hear the sounds of arcade machines, the excited screams as kids ride the rollercoasters, and the chattering of the adults watching on in this 5-reeled video slot which contains 15 paylines. Of course, you’ll have to pay for tickets to access the rides at this theme park and with five coins allowed to be staked per payline and coin denominations of 2p, 5p, 10p, 20p, or 50p this means you can get tickets from just 30p up to £37.50 if you’re planning on making your way around all of them. 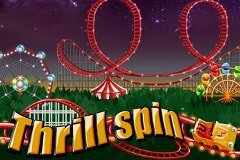 In addition to this Thrill Spin boasts a 95.90% return to player percentage (also known as RTP) therefore the fun is sure to last for the whole day! There’s lots of fun to be had at the theme park with a variety of things to do and see, as highlighted by the thirteen symbols that feature on the reels of the Thrill Spin slot machine. You’ll hear the loud screams of kids on a rollercoaster as they plunge from the highest point to the lowest, with one little girl waving her arms in the air having the time of her life as the clouds rapidly pass by, and this is the Wild symbol with the ability to substitute for all symbols except the Scatter, plus it is also the most valuable symbol on the reels as five on a line sees you rewarded with the jackpot prize of 10,000 coins! The Scatter symbol is represented by an old man who pops up smoking a pipe with lots of balloons for sale which start popping one by one when part of a winning combination. Of all the other symbols it’s the Haunted House which is the most valuable as five of them appearing on a line result in a 1,000-coin win which is worth the spooky experience. There is also a Ferris Wheel to take in the surroundings, enjoy a ride on the Carousel Wheel as you sit on a pony and relive childhood memories, purchase some Ice Cream and Lollipop’s for a snack in between rides, or a Hot Dog and Soda for something a little for filling, and you’ll also see ride tickets and Ace to 10 icons on the reels which offer the smallest payouts. Despite all of the thrilling rollercoasters and other rides that you can experience in the amusement park, the most exciting times are whenever you see the old man with the pipe selling balloons (Scatter symbol) pop up on the reels three times of more during the same spin. This sees you trigger a free spins bonus feature that presents you with 15 free spins, and as if that wasn’t a generous enough amount, all wins that you achieve from them are subject to a 3x multiplier bonus to further boost them. Of course, you will also enjoy Scatter wins multiplied by your stake too for triggering the feature with a 500x win to enjoy should you land five Scatter symbols on the reels at once, with four rewarding you with a 25x win, three with a 5x and two with a 2x win (which actually occurs very frequently), and to top it all of you can re-trigger additional free spins to keep the fun going! Just How Thrilling Is It? The colourful design and busy sounds Net Entertainment have included in the Thrill Spin slot machine make you feel like you’re on the premises of a theme park, however it only features a free spins mode which is rather disappointing if, like me, you have played their Theme Park – Tickets of Fortune slot machine as it boasts several more bonus features and provides you with the opportunity for wins of even greater heights!